Habitat: Mainly in dry eucalypt forests and woodlands, with a well-developed understorey. Food: Mainly insects, but also nectar, fruit, manna, lerp and insect by products. Status: Secure in all states except NT and TAS where they are not present. The White-eared Honeyeater is a common resident of dry eucalypt forests. It mainly feeds in trees and shrubs, gleaning insects and other invertebrates from the bark and branches, as well as occasionally taking nectar from flowers in the canopy. They also build their neatly woven, cup-shaped nests in the canopy of trees. These nests are made from grass or bark bound together with spider webs, and lined with hairs. These hairs are usually obtained by plucking them from kangaroos, possums, farm animals, and, occasionally, people walking through the bush! The White-eared Honeyeater is a medium-sized honeyeater with a strong bill. It is olive-green above with lighter green underparts. It has a grey cap, a black face and bib (under bill) with a distinctive, contrasting white ear-patch. The sexes are similar in plumage but the males are larger. Young are duller and browner. Usually seen in pairs or small family groups, and are quite noisy and conspicuous. The White-eared Honeyeater is rarely confused with other honeyeaters. The similarly sized Lewin's Honeyeater is much larger and darker, with a yellow ear patch, and lacks the black face and bib. 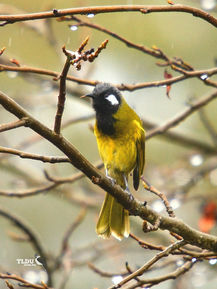 The White-eared Honeyeater is found in mainland eastern and southern Australia, ranging from south-eastern Queensland, mainly east of the Great Dividing Range, to eastern South Australia, with populations in southern Western Australia. It is widespread in the Sydney sandstone region. The White-eared Honeyeater is found mainly in dry eucalypt forests and woodlands, with a well-developed understorey. They can also be found in a range of heath, shrubland and scrub habitats, and at a variety of altitudes, from the coast to the tree line in the Southern Alps, but are rarely found in tropical zone. They are not common in agricultural areas, but will be seen in gardens, orchards and vineyards in rural areas. In Sydney they forage in mangroves. The White-eared Honeyeater feeds mainly on insects, but also nectar, fruit, manna, lerp, and honeydew (insect by-products). They forage under strips of bark or in crevices, mainly of eucalypts, and also feed at wounds on tree trunks. White-eared Honeyeaters usually build their nests close to the ground in shrubs or low trees, making a deep, thick-walled, open cup, lined with the fur or hair of mammals, including humans. The female incubates the eggs, and the young are fed by both parents. Nests are parasitized by the Fan-tailed and Pallid Cuckoos, and the Horsfield's and Shining Bronze-cuckoos.